In order to install our oil catch can kit on an FSI motor the engine cover must be modified. 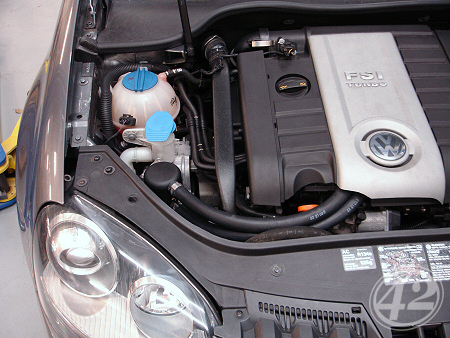 The required modifications are slight and do not affect the function of the airbox or the fitment of the cover. Although we typically design our products to be installed without modification, in this case we had no choice. 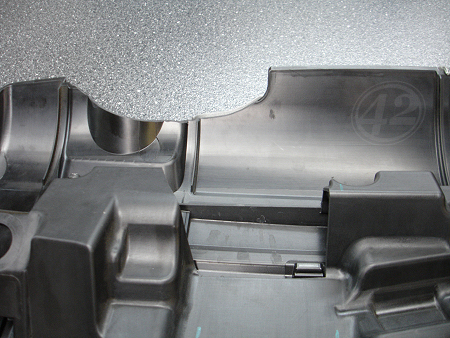 The FSI engine cover is molded around the engine leaving no room for our PCV tubing. A few simple clearance cuts allow the tubing to route without interference. To help with this modification we've put together some photos and documentation from our install. The first step to modifying the engine cover is removing it. The FSI engine cover is held in-place by four grommets. To remove the cover, simply pull it off. Pull hard, straight up. We don't recommend pulling near the oil cap as the cover may crack. If any of the grommets are left on the posts, remove them and re-install them in the cover for later. Once the cover is off, use a phillips head screwdriver to remove all screws holding the two halves together. Split the halves and set the cover aside. Complete your oil catch can installation, fully routing the new PCV tubing. Sit the lower half of the engine cover on top of the engine, resting the grommets on the posts. Your PCV tubing should follow the same route pictured below. Using the photos below as a guide, mark the lower half of your engine cover to be cut. 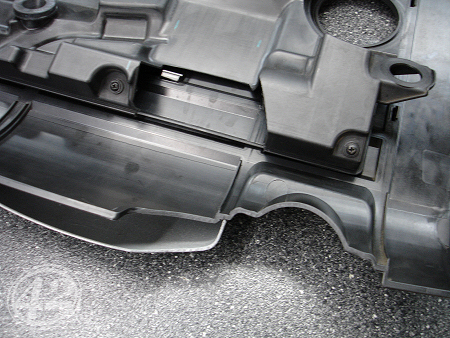 Your cutting pattern may vary, but should fit within the basic constraints as the engine cover below. We used a wood cutting bandsaw to cut our cover. If you don't have access to a bandsaw, tin snips or even a hacksaw will work. 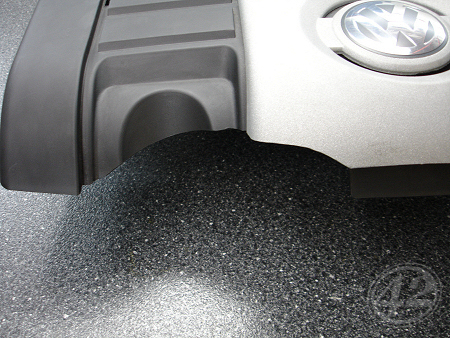 Once you've made the cut, install the lower half of the engine cover to check clearance. Push the cover down over all four grommets. If your PCV tubes clear, remove the cover and de-burr the cut using sandpaper. If your PCV tubes do not clear, cut deeper into the cover until they do, conservatively. 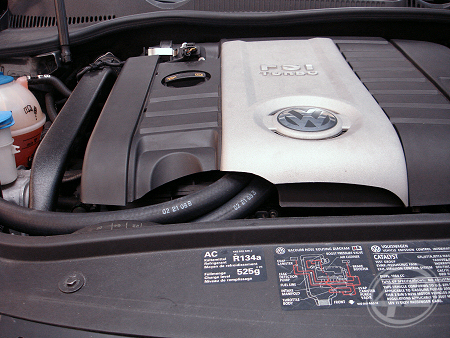 The upper half of the engine cover must also be modified. 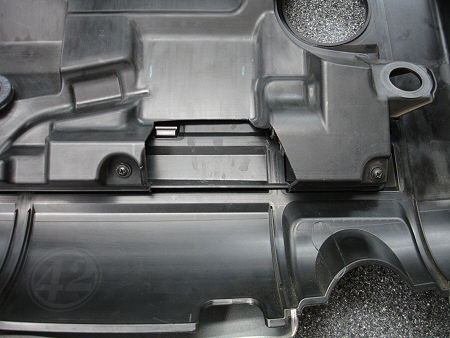 Using the photos below as a guide, trace the basic shape we cut onto the back of your engine cover. We cut a smooth semi-circle starting with the clearance notch for the throttle body and ending at the left side of the dipstick contour. This shape will extend into the silver portion of the cover which will also need to be trimmed. Below you will see our semi-circular cut from the front of the engine cover. As you can see, the silver portion of the cover was trimmed along the same line. 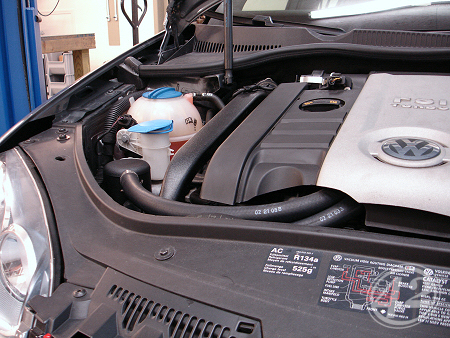 Once you've trimmed the top portion of your engine cover, re-assemble the cover without the filter or screws. Install the cover, pushing the grommets down over the posts. Your engine cover and PCV tubing should look like the cover below. If your PCV tubes have plenty of clearance, remove your engine cover and de-burr the top cuts with sandpaper. Re-assemble the cover with filter and all screws. Re-install the engine cover and enjoy your new catch can setup! If your PCV tubes don't clear, take a look at your cuts and make sure you've followed the same lines we did. 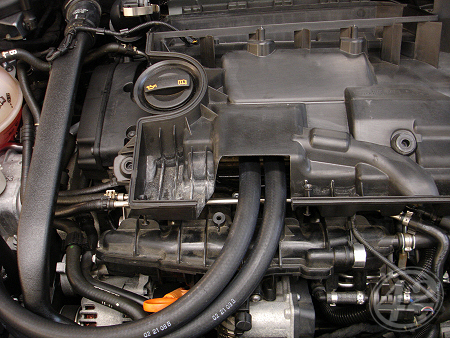 It's possible you may need to trim further into the engine cover. 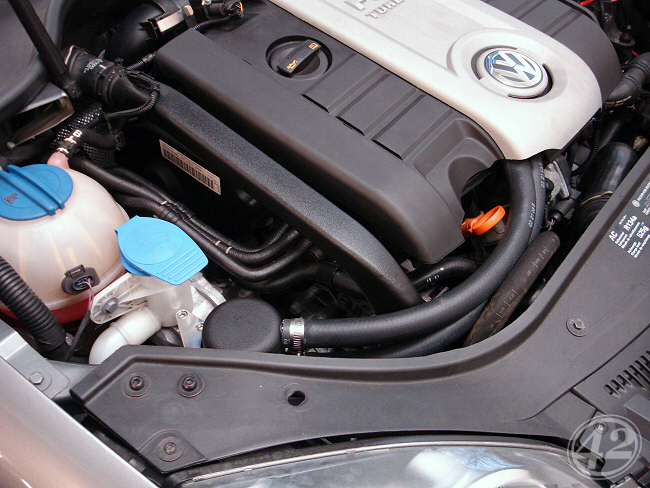 It is very important that your PCV tubes are not pinched by the engine cover. Pinched lines can cause idle problems and poor PCV evacuation - a dangerous situation. Please note - if you are running an aftermarket air intake you may not be using your engine cover. In that case, this tech article does not apply to your installation. If you have any questions about this modification, feel free to contact us.